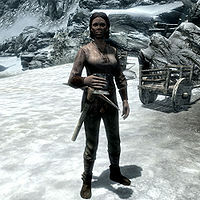 Irgnir is a Nord miner who works for Beitild at the Iron-Breaker Mine in Dawnstar. She is one of many Dawnstar citizens being plagued by nightmares, and if you speak to her, she will insist that the dreams are real. She sleeps inside her house every night between midnight and 8am and immediately heads out to Iron-Breaker Mine where she works the smelter all day long, her efforts overseen by the bossy Beitild. Her evenings are spent inside Windpeak Inn where she usually dines and chats with a worker from the competing mine, namely Fruki. The only exception to this routine happens when you first arrive at Dawnstar, when she will be one of the angry citizens complaining to Erandur inside the inn. She wears common miner's clothes, and carries nothing in her pockets but a key to her house, a pickaxe, and a selection of lower-class items and gold. Before Waking Nightmare is completed, she will tell you: "These dreams are real I tell you. Real!" Otherwise, she is not interested in chatting: "I'm just one of the miners. I don't want any trouble." and "You should speak to the Jarl if you need something, stranger." Irgnir: "It's a curse! It has to be! I've got to get out of this town." Fruki: "Irgnir, get a hold of yourself. They're just dreams. Please tell her, Erandur." Erandur: "Listen to your friend, Fruki. They are just dreams, my dear. I assure you that it is quite normal." Irgnir: "It's the same dream over and over again. You think that's normal? It's evil I tell you!" Fruki: "Erandur, she has a point. You keep telling us no harm will follow these dreams, but they must be an omen." Thoring: "Give him a chance to speak. He's trying to help us." Erandur: "Everyone, please. I'm doing what I can to end these nightmares. In the meantime all I ask is you remain strong and put your trust in Lady Mara." Irgnir: "I... I will. Thank you..."
Irgnir: "You should quit working in the Eastern Mine. Leigelf's no good to work for." Fruki: "Leigelf is a good man, and I'm not running out on him now." Irgnir: "Oh, got a bit of an interest in your boss do you?" Fruki: "No, not that it's any of your business." Irgnir: "Tough day at the mines. I swear the ore is getting harder to dig." Fruki: "You're just getting older." Irgnir: "That's why I come here to talk to you. You're all heart." This page was last modified on 19 October 2013, at 16:49.